Leslie Mortier Shaw (November 2, 1848 – March 28, 1932), known as L. M. Shaw, was an American businessman, lawyer, and politician. He served as the 17th Governor of Iowa and was a Republican candidate in the 1908 presidential election. Shaw was born in Morristown, Vermont, the son of Boardman O. Shaw and Louise Spaulding "Lovisa" Shaw. He attended Cornell College in 1874. Shaw married the former Alice Crenshaw on December 6, 1877, with whom he had three children. He became a lawyer and banker, and in 1898 became the 17th Governor of Iowa, serving until 1902. He then became the U.S. Secretary of the Treasury under President Theodore Roosevelt from 1902 to 1907. Like his predecessor Secretary Lyman Gage, Shaw firmly believed that the Treasury should serve the money market in times of difficulty through the introduction of Treasury funds. To this end, Shaw bought back the government bonds from commercial banks that owned them, increased the number of government depository banks, and in 1902, he told the banks that they no longer needed to keep cash reserves against their holdings of public funds. The intended effect of these actions was to provide a more elastic currency which would then respond to the needs of the market. The government intervention in the money market reached its height with Shaw. He resigned on March 3, 1907, to become as the banker in New York City. He was a candidate for the Republican Party nomination during the U.S. presidential election in 1908. After leaving the Presidential Cabinet and his public life, he returned to banking, working in New York City. Shaw died in Washington, D.C., and was buried in Oakland Cemetery in Denison, Iowa. Patton, Eugene B. (1907). "Secretary Shaw and Precedents as to Treasury Control over the Money Market". Journal of Political Economy. 15 (2): 65–87. doi:10.1086/251290. JSTOR 1817458. Wikimedia Commons has media related to L.M. Shaw. Wikisource has the text of a 1905 New International Encyclopedia article about L. M. Shaw. William Boyd Allison was an early leader of the Iowa Republican Party, who represented northeastern Iowa in the United States House of Representatives before representing his state in the United States Senate. By the 1890s, Allison had become one of the "big four" key Republicans who largely controlled the Senate, along with Orville H. Platt of Connecticut, John Coit Spooner of Wisconsin and Nelson W. Aldrich of Rhode Island. Jonathan Prentiss Dolliver was a Republican orator, U.S. Representative, then U.S. Senator from Iowa at the turn of the 20th century. In 1900 and 1908 Republican National Conventions, he was promoted as a vice-presidential candidate, but he was never chosen. Philander Chase Knox was an American lawyer, bank director and politician. A member of the Republican Party, Knox served in the Cabinet of three different presidents and represented Pennsylvania in the United States Senate. George Sewall Boutwell was an American politician, lawyer, and statesman from Massachusetts. He served as Secretary of the Treasury under U.S. President Ulysses S. Grant, the 20th Governor of Massachusetts, a Senator and Representative from Massachusetts and the first Commissioner of Internal Revenue under U.S. President Abraham Lincoln. He was a leader in the impeachment of U.S. President Andrew Johnson. 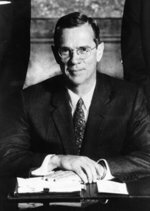 William McChesney Martin Jr. was the ninth and longest-serving Chairman of the United States Federal Reserve Bank, serving from April 2, 1951, to January 31, 1970, under five presidents. Martin, who once considered becoming a Presbyterian minister, was described by a Washington journalist as "the happy Puritan". Albert Baird Cummins, American lawyer and politician. He was the 18th Governor of Iowa elected to three consecutive terms and U.S. Senator for Iowa serving for 18 years. Lyman Judson Gage was an American financier and Presidential Cabinet officer. George Henry Williams was an American judge and politician. He served as Chief Justice of the Oregon Supreme Court, was the 32nd Attorney General of the United States, and was elected Oregon's U.S. senator, and served one term. Williams, as U.S. senator, authored and supported legislation that allowed the U.S. military to be deployed in Reconstruction of the southern states to allow for an orderly process of re-admittance into the United States. Williams was the first presidential Cabinet member to be appointed from the Pacific Coast. As attorney general under President Ulysses S. Grant, Williams continued the prosecutions that shut down the Ku Klux Klan. He had to contend with controversial election disputes in Reconstructed southern states. President Grant and Williams legally recognized P. B. S. Pinchback as the first African American state governor. Williams ruled that the Virginius, a gun-running ship captured by Spain during the Virginius Affair, did not have the right to bear the U.S. flag. However, he argued that Spain did not have the right to execute American crew members. 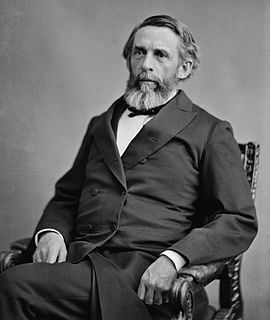 Nominated for Supreme Court Chief Justice by President Grant, Williams failed to be confirmed by the U.S. Senate primarily due to Williams's removal of A. C. Gibbs, United States District Attorney at Portland, Oregon. Edward Casper Stokes was an American Republican Party politician, who served as the 32nd Governor of New Jersey, from 1905 to 1908. Clyde LaVerne Herring, an American politician and Democrat, served as the 26th Governor of Iowa, and then one of its U.S. Senators, during the last part of the Great Depression and the first part of World War II. William Peters Hepburn was an American Civil War officer and an eleven-term Republican congressman from Iowa's now-obsolete 8th congressional district, serving from 1881 to 1887, and from 1893 to 1909. According to historian Edmund Morris, "Hepburn was the House's best debater, admired for his strength of character and legal acumen." As chair of one of the most powerful committees in Congress, he guided or sponsored many statutes regulating businesses, including most notably the Hepburn Act of 1906. The Hepburn Act authorized the U.S. Interstate Commerce Commission to require railroads to charge "just and reasonable" rates. This article is about the history of the United States Federal Reserve System from its creation to the present. Neel Tushar Kashkari is an American banker and politician who is President of the Federal Reserve Bank of Minneapolis. As interim Assistant Secretary of the Treasury for Financial Stability from October 2008 to May 2009, he oversaw the Troubled Asset Relief Program (TARP) that was a major component of the U.S. government's response to the financial crisis of 2007–08. A Republican, he unsuccessfully ran for Governor of California in the 2014 election. Claude Rodman Porter was a member of the Iowa General Assembly, United States Attorney, and perennial Democratic runner-up to Republican victors in three races for Iowa governor and six races for U.S. senator. In an era in which Republicans in Iowa won so often that Senator Jonathan P. Dolliver remarked that "Iowa will go Democratic when Hell goes Methodist," Porter twice came closer to winning the governorship than all but one other Democratic candidate of that era. He later served as a member of the U.S. Interstate Commerce Commission for eighteen years. 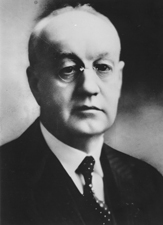 George Evan Roberts was Director of the United States Mint from 1898 to 1907, and again from 1910 to 1914.